This innovative and forward looking work examines the Genoa summit agenda with a view to strengthening international conflict prevention institutions and identifying and analyzing economic early warning indicators. It devotes particular attention to the Italian contribution and approach and the ways in which it can be effectively implemented following the summit. 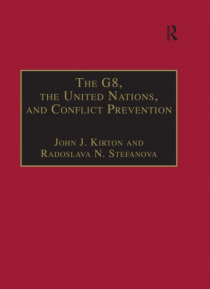 The first book to compare the rol… e of the G8 and the United Nations in conflict prevention and human security, The G8, the United Nations, and Conflict Prevention will be essential reading for academics, government officials and members of the business and media communities.